Lock in a great price for Neonele – rated 8.6 by recent guests! It is clean and nice. The house itself is making you go "Wow!". 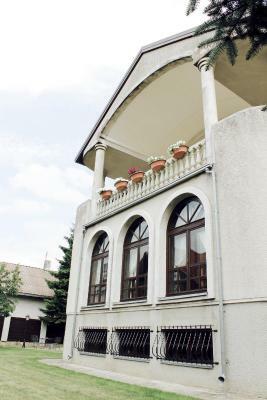 The "public" area of the house is large and cozy with nice lobby, kitchen, a separate room with bookshelf, a large balcony and a garden. The room is modern and quiet. We liked place very much. Friendly staff, big spacy rooms and fully equipped kitchen. Indeed hotel is 2 km from city crenter, but we enjoyed quiet surroundings. Hotel offers free parking space. Приятный интерьер, домашний уют, тишина. Тактичная, приятная в общении хозяйка. Радушные хозяева,красивый дом и территория вокруг,было очень комфортно. Очень хороший интерьер гостиницы. Просторные и светлые номера. Хорошо оборудованная кухня. Ухоженная территория вокруг гостиницы. Удобное месторасположения если запланированы поездки (экскурсии) на собственном транспорте. Сразу оказываешься на трасе. Не надо пересекать центр Паланги. Если хочется оставить свой транспорт возле гостиницы, то недалеко расположен автовокзал. Что также удобно. Maja asus eramajade rahulikus piirkonnas. Villa tüüpi maja , mis kohandatud majutusteenuse osutamiseks. Tuba oli eriti avar, koos elementaarse kööginurgaga. Hinna ja kvaliteedi tase tundus olevat paigas. Ühiskasutuses oli maja teisel korrusel asuv väga avar terrass, mugava terrassimööbliga! Постельное бель действительно чистое и свежее. Персонал приветливый. Тихо. Тихо, чисто, уютно, замечательные хозяева, отличный дизайн комнат, превосходная терраса, хорошее место для барбекю в саду. 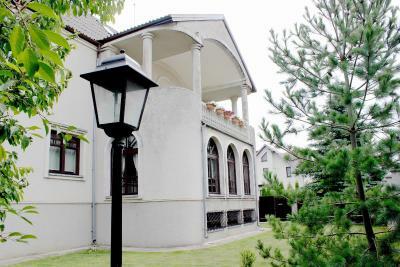 Located away from Palanga’s busy center, Neonele is a guest house that offers rooms with a refrigerator and free Wi-Fi. It provides free private parking. The rooms of the Neonele were designed in a way to give them a cozy atmosphere. All rooms are heated and have a seating area. All include an electric kettle and a hairdryer. Guests have access to a communal kitchen. They may also rent out a bike directly at the Neonele or visit its steam bath. The guest house features a designated barbecue area. There also is a fireplace area at guest’s disposal. The center of Palanga is 1 mi away, and Basanaviciaus Street is within 1.4 mi. E272 expressway is 0.8 mi from the guest house. When would you like to stay at Neonele? This triple room has a sofa, electric kettle and microwave. This family room has a balcony, microwave and kitchen. This suite has one double bed. This apartment offers 4 single beds, 1 sofa bed and 2 large double beds. House Rules Neonele takes special requests – add in the next step! Neonele accepts these cards and reserves the right to temporarily hold an amount prior to arrival. Please note that use of all additional guesthouse services must be ordered in advance and needs to be confirmed by the guesthouse. These services may carry an additional fee. Please inform Neonele of your expected arrival time in advance. You can use the Special Requests box when booking, or contact the property directly using the contact details in your confirmation.